The police recovered a pistol and some ammunition from sacked chairman of the Uttarakhand Minorities Commission Sukhdev Singh Namdhari’s residence in Bazpur in Udham Singh Nagar district today. Former Prime Minister Inder Kumar Gujral’s condition is critical but stable, said his son and Rajya Sabha MP Naresh Gujral outside the hospital here where the ailing former Prime Minister has been admitted in a critical condition. New Delhi, November 25 Keeping the controversy alive, former CAG official R P Singh today said that the Public Accounts Committee did suggest one of the methodologies to the CAG to calculate the losses due to 2G spectrum allocation which were pegged at Rs 1.76 lakh crore in the final report. Cracking the whip, the BJP today suspended Ram Jethmalani with immediate effect for daring the party to act against him on the CBI chief's appointment issue, saying it was gross indiscpline. From a shy, home-maker to a rabble-rousing public speaker, the transformation of YS Sharmila Reddy has been swift and effortless. The 38-year-old daughter of former Andhra Pradesh Chief Minister late YS Rajasekhar Reddy was never interested in politics. However, the force of circumstances has seen her don the new role with aplomb. External Affairs Minister Salman Khurshid and his wife Louise are well known for their warm hospitality. Their annual mango party and Christmas lunch is a must on everybody’s social calendar. Four years after the Mumbai terror attacks which claimed 166 lives and injured more than 300 others an ambitious project to install Closed Circuit Televisions (CCTVs) across Mumbai to aid real-time monitoring has got stuck in red tape. The Ministry of Health suffered huge embarrassment yesterday when the parliamentary panel examining the feasibility of establishing an overarching health regulator rejected the Bill in this regard. Mumbai, November 25 Mumbai terror attack conspirator David Headley, who had surveyed most of the 26/11 targets, had also conducted a recce of Bal Thackeray's heavily-guarded residence `Matoshree' in suburban Bandra in 2008, and found that Shiv Sena chief was a "sitting duck". New Delhi, November 25 The government has asked the Indian Mission in Berne to get in touch with banking authorities of Switzerland for obtaining details of businessman Hasan Ali Khan's Swiss bank accounts in connection with the probe into one of the biggest tax evasion scams in the country. BJP vice-president and the party’s Punjab unit in-charge Shanta Kumar today said that all issues with alliance partner — the SAD — would be resolved amicably and that the coalition was gearing up to win all the 13 Lok Sabha seats from the state in the 2014 parliamentary poll. Fifteen differently abled youngsters who had to undertake train journey from Guwahati to Delhi to participate in “Jashne Bachpan” had harrowing time last week. The reason: Lack of basic facilities for physically challenged persons at the Guwahati and New Delhi railway stations. Pushing for amendments into the Draft Rights of Persons with Disabilities Bill, 2012, patients of haemophilia yesterday urged the government to include haemophilia under the ‘benchmark disabilities’, an earmarked category which grants differently-abled people with benefits such as reservation in jobs and insurance coverage among other benefits. Decades after Lala Lajpat Rai presided over the inaugural session of the All-India Trade Union Congress (AITUC), workers bodies from across the political spectrum will converge at its 40th session in Mumbai this week to finalise preparations for an all-India stir. At least five persons, including a child, were charred and over a dozen others injured in a fire accident at Manikonda area in the city, the police said. A team of the Delhi Police brought the suspect in the Ponty Chadha and his brother Hardeep Chadha murder case to his Bazpur residence today. Namdhari who is on a five-day police remand after being charged by the Delhi Police was also taken to his farmhouse. He was taken into custody on Friday from his Bazpur house where he had appeared after several days. Namdhari is a key eyewitness in the Chattarpur farmhouse shootout where the Chadha brothers were killed. Namdhari had escaped unhurt in the incident. Namdhari had initially told the Delhi Police that he along with Ponty Chadha had gone to the Chattarpur farmhouse where Hardeep fired at them, killing Ponty. He took cover behind a vehicle while Sachin Tyagi, his official gunman, fired from his official weapon, killing Hardeep. Namdhari had also lodged an FIR against Hardeep. The Delhi Police found many discrepancies in his account, and charged and arrested him after Hardeep’s postmortem report was released. Investigation has revealed that Namdhari had fired at Hardeep, though the police is not sure who fired first. Namdhari has emerged as the main conspirator with the police claiming that Namdhari had provoked Ponty to take possession of the farmhouse forcefully. Hardeep’s post-mortem report has proved instrumental in tightening the noose around Namdhari. Sources said the postmortem showed two different types of bullets in Hardeep’s body, raising doubts over Namdhari’s claim that his gunman had shot Hardeep in self-defence. Delhi DCP (Crime Branch) SBS Tyagi on Sunday said Sachin Tyagi, personal security officer of Sukhdev Singh Namdhari, was picked up for questioning and released on condition that he would join investigation when the need arose. He was admitted on a complaint of lung infection. Gujral (92) who has been unwell for some time, was put on ventilator support on Saturday after his condition deteriorated. Gujral has been on dialysis for over a year now and had suffered a serious chest infection some days ago. Keeping the controversy alive, former CAG official R P Singh today said that the Public Accounts Committee did suggest one of the methodologies to the CAG to calculate the losses due to 2G spectrum allocation which were pegged at Rs 1.76 lakh crore in the final report. Dismissing reports that he had gone back on his statement, Singh said after he had given his draft report on the 2G scam in 2010, the PAC, under Murli Manohar Joshi, had shown interest in the loss figures and had suggested one of the methodologies that led to calculation of loss of Rs 1.76 lakh crore. He said evidence to this effect was also in a note prepared by R B Sinha, Director General (Report Central) in the CAG. A defiant Jethmalani, an eminent lawyer and Rajya Sabha MP, who had recently demanded party chief Nitin Gadkari's resignation in the wake of charges of alleged dubious funding of the latter's Purti Group, said, "nobody has the guts to take action against me". With her elder brother and president of YSR Congress Party YS Jagan Mohan Reddy being jailed in the illegal assets case, the mantle of carrying forward the fledgling party has fallen on her slender shoulders. She is now on a 3000-km long walkathon across the state. The mass contact programme has been drawing huge crowds, making Sharmila the house-hold name in the state. Clad in Salwar-Kameez and sporting sneakers, Sharmila walks breezily, covering 15-2-0 km a day, interacts with the villagers en route and addresses meetings in towns. Adopting mannerisms and speaking style of his charismatic father, she has been able to strike an emotional chord with the people and her speeches focus on how the present Congress government was trying to erase the memory of her father, defame his family and block the political career of Jagan by framing false charges against him. “My name is Sharmila. I am the daughter of YSR and sister of your beloved Jagan Anna,” she introduces herself, sending the crowds into raptures. She goes on to talk about her mission to expose the “misdeeds” of the Congress and its “nexus” with Opposition Telugu Desam Party chief N Chanrababu Naidu to “neutralise” Jagan. In an interview to The Tribune in the midst of her padayatra, Sharmila made it clear that she was “just filling in” for her jailed brother. “The moment he comes out of the jail, he will take over and I will retreat into the background,” she said. Jagan is currently lodged in a jail here following his arrest by the CBI in May this year on charges of amassing wealth through illegal means during YSR’s tenure as Chief Minister between 2004 and 2009. How has the outpouring of public adulation changed her life ever since she hit the roads on October 18? “I am a very private person and I had not sought something like what I am doing now. As of now, I am only a representative of my brother. Sharmila said. On the contentious Telangana statehood issue, Sharmila tried to tread a politically correct line, saying “Our party is not opposed to the formation of a separate state and we respect the sentiments of the people of this region. Our objective is to ensure that all the regions of the state thrive and progress. External Affairs Minister Salman Khurshid and his wife Louise are well known for their warm hospitality. Their annual mango party and Christmas lunch is a must on everybody’s social calendar. Their invitations to these dos are usually simply worded. But this time, the email invite had an unusual touch. It read: “Hurricane Sandy hit NewYork and New Jersey Cyclone Nilum hit Chennai and Kancheepuram. We’ve gone through our own share of tornadoes. Or at least a man-made tsunami But there’s value in the old adages:“There’s light at the end of the tunnel. And if winter comes, can spring be far behind?” Come celebrate new beginnings with us: Salman’s new avatar as the Great Indian Traveller And, of course, the coming festival of Christmas.” The irony was unmistakable. The use of the words “man-made tsunami” were a clear reference to the recent unseemly controversy over their family-run NGO in which Khurshid and Louise were recently embroiled in. As the invitation said, this year’s party will also celebrate Khurshid’s recent elevation as the External Affairs Minister. The term “inscrutable oriental” is best suited to describe the Chinese who are famous for not betraying any emotion, irrespective of the situation they may find themselves in. Prime Minister Manmohan Singh also falls in that category as his impassive expression never gives away anything. So when Chinese Premier Wen Jiabo and the PM had a bilateral meeting on sidelines of the ASEAN meeting in Cambodia, it was business as usual. But their interaction had a surprise ending. After the two leaders shook hands and were going their separate ways, Wen suddenly retraced his steps, embraced PM Singh in a warm bear hug. He then went on to tell the PM him that this was his last meeting with him in this capacity (a new leadership is taking over in China). Taken aback by this sudden show of affection, the PM recovered sufficiently to reciprocate, telling the Chinese leader that he looked forward to meeting him in future in different capacities. Before he moved into Rashtrapati Bhavan, President Pranab Mukherjee had been content staying at 13, Talkatora Road, a modest bungalow which he had occupied since 1996. He had refused to shift out even when he was entitled to a bigger bungalow, partly because he considered this place lucky and partly because his wife was not keen on moving house. As it happens, the President will be able retain his link with the house to which he had such a great attachment. The bungalow has now been allotted to his son Abhijeet Mukherjee, a new entrant to the Lok Sabha. He contested and won from Jangipur, the constituency vacated by Pranab Mukherjee. He will be hoping the house will prove to be as lucky for his son as it was for him. Last year, a consortium headed by Mukesh Ambani's Reliance Industries Ltd emerged as the front-runners to bag the project under which 6,000 CCTVs were to be installed at all major roads in the city. The project also envisaged setting up of control rooms for continuous real-time monitoring of footage from the CCTVs. However, after questions were raised about the technical capabilities of the companies that were part of the consortium, the government decided to invite fresh proposals. “We have called for a Request for Proposal (RFP) from companies to design, supply and commission a CCTV surveillance network in Mumbai,” said a senior state government official. The contract would be valid for five years. The RFP was put out last month and responses were still being received from various companies. Sources say the bids would be finalised in the next few days after which a technical committee will scrutinise the bids. Officials say, companies, which are part of the consortia, would have to satisfy a number of security criteria being prescribed by the government. All those who are part of the project will have to undergo security clearances from the Central intelligence agencies, sources said. With estimates for the entire project coming to as much as Rs 1,000 crore, the Maharashtra Government is keen on avoiding allegations of corruption. Bidders who make the cut will then be scrutinised by a high-level panel which would have top bureaucrats and ministers, the sources said. Ram Pradhan Committee appointed by the government to look into the security aspects of Mumbai following the terror attacks had recommended the installation of CCTV cameras in all the major cities of Maharashtra. However, there are only a handful of CCTVs installed in different parts of Mumbai that too by the traffic police. According to officials, most of these CCTVs are non-functional as the contracts to maintain them haven't been renewed. Seldom does a department-related standing committee of Parliament - health in this case - return a government Bill asking it to redo the entire draft. The principal objection of the panel is the disregard for the role of the states in the constitution of the commission envisaged as the mother body with three constituents - National Board of Health Education, National Evaluation and Assessment Committee and the National Councils replacing the Medical Council of India (MCI), Dental Council of India (DCI), Nursing Council (NCI) and the Pharmacy Council of India (PCI). The commission would have a chairperson, four full-time members and eight part-time members - all appointed by the Central Government in consultation with the selection committee. The Bill is silent on the exact procedure for appointment and says, “Chair and members shall be appointed in such manner by the Centre as may be prescribed”. “The composition of the commission gives no representation to states which play a vital role in the delivery of medical education. States know their medical capacity and their future requirements better. The Bill must address the need to give representation to states in the commission,” says the panel. In another setback to the Health Ministry, the panel has questioned its decision to place medical research under the purview of the HRD Ministry piloted Higher Education and Research Bill 2011 which seeks to create an overarching regulator in the higher education by subsuming the UGC, the All-India Council for Technical Education and the Architecture Council of India. “We don’t agree with the ministry’s contention that health research requires a forum like the National Commission for Higher Education which the HRD Ministry Bill seeks to create. “There is a separate department of medical research mandated with the responsibility of developing related aspects. Medical research should not be kept under the jurisdiction of more than one ministry,” the report states, slamming the year-long efforts which the HRD Ministry, led by former minister Kapil Sibal, made to convince his health counterpart Ghulam Nabi Azad to put the entire higher education research, including medical research, under the National Commission for Higher Education and Research (NCHER). Finally, the PMO had to intervene to make this happen. Mumbai terror attack conspirator David Headley, who had surveyed most of the 26/11 targets, had also conducted a recce of Bal Thackeray's heavily-guarded residence `Matoshree' in suburban Bandra in 2008, and found that Shiv Sena chief was a "sitting duck". In his soon-to-be-released book, `Headley and I', about filmmaker Mahesh Bhatt's son Rahul's unusual friendship with Headley during the latter's stay in Mumbai, author-journalist Hussain Zaidi has revealed how the LeT operative scanned Thackeray's residence with the help of Shiv Sena activist Vilas, a gym instructor. Pakistani-American Headley frequently visited a gym in south Mumbai where Rahul Bhatt and Vilas worked out, and befriended them. Headley, according to Zaidi, found loopholes in the late Sena chief's security at Matoshree. The book -- to be released within a week, Zaidi told PTI -- also reproduces Headley's statements recorded by the National Investigation Agency (NIA) in Chicago. According to Zaidi, the book tells how Headley once even visited Matoshree and photographed it for 15 minutes, posing as `a fan'. Post-Matoshree visit, Headley told Rahul that Thackeray was "a sitting duck". "A small bunch of desperadoes can break that security cover and reach Thackeray. I have no idea why the police are so proud of the protection he has been given," Headley is quoted as having said. During reconnaissance of several targets in the metropolis, the Pakistan-origin US national, who had learnt to play golf in Lahore, made a visit to Willingdon Club here too, and termed a possible strike on the posh club as "icing on the cake". Zaidi said the book also talks about Headley's visit to Shiv Sena headquarters in Dadar for a video surveillance. Posing as an immigration agent, he had met Sena public relations officer Rajaram Rege and befriended him. Headley also went to the famous Siddhivinayak temple with Vilas and Bhatt, from where, under instructions from his bosses in Pakistan, he bought several red `maulis', later also seen tied around 26/11 gunman Ajmal Kasab's wrist, says the book. 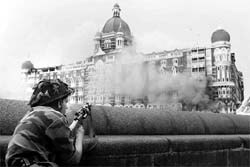 The day hotel Marriott was bombed in Islamabad, Headley had told Rahul to "watch out" for a similar attack in Mumbai. The Marriott Hotel bombing occurred on the night of 20 September 2008, when a dump truck filled with explosives blew up, killing over 50 people. On November 10, 2008, sixteen days before 26/11, the LeT operative called Rahul by a satellite phone and specifically advised him against venturing into south Mumbai over the next few days, according to Zaidi. After the attack, Headley called to ask if Rahul and his family were safe. A few months later, as the investigators probed the case and accessed phone intercepts, Rahul was picked up by NIA in connection with the 26/11 terror strike. Headley, on March 18, 2010, pleaded guilty to charges of conspiracy in the Mumbai terror strike and plotting to attack a Danish newspaper which had published controversial cartoons of prophet Muhammad. He struck a plea-bargain deal with the US authorities. The government has asked the Indian Mission in Berne to get in touch with banking authorities of Switzerland for obtaining details of businessman Hasan Ali Khan's Swiss bank accounts in connection with the probe into one of the biggest tax evasion scams in the country. The Finance Ministry has written to the External Affairs Ministry to approach the Swiss banking authorities to allow a team of investigators drawn from the Enforcement Directorate and the Income Tax department who will place a "comprehensive money laundering and criminal tax evasion" report on the Pune-based stud farm owner and his associates. Shanta Kumar was reacting to BJP ministers’ complaint that they did not have any voice in the Punjab Government. He said there was some talk in this regard but it had been resolved. All issues between the two alliance partners would be ironed out in joint meetings, he said. Earlier, at the meeting, state executive members raised the issue of crisis in the farming sector due to low minimum support price (MSP). It demanded an increase in the MSP of wheat to ensure good returns to Punjab farmers. Shanta expressed satisfaction at the work done by the state unit in the past three years. The executive meeting was held under the chairmanship of state president Ashwani Sharma and attended by Balramji Dass Tandon, general secretary Kamal Sharma, MP Vinod Khanna, Swaran Salaria and Cabinet Ministers Bhagat Chunni Lal, Madan Mohan Mittal, Anil Joshi and Surjit Kumar Jyani. Sishu Sarothi, the city-based NGO to which these children belong, has decided to move the Gauhati High Court seeking its intervention to make disabled-friendly facilities available at the railway station and commercial places in Guwahati. Arman Ali, executive director of Sishu Sarothi, said their students started their journey from Guwahati on November 17. As no ramps were available at the Guwahati railway station, the youngsters had to taken to the platform through the cargo offload route. A similar hardship awaited them at the New Delhi railway station, too. Woes of the youngsters, who were invited to New Delhi by the National School of Drama to perform a play at “Jashne Bachpan”, were compounded inside the train due to lack of amenities for the physically-challenged on board. “The NGO has now decided to knock at the door of the Gauhati High Court, seeking its intervention to make Guwahati a disabled-friendly city,” he added. under the ‘benchmark disabilities’, an earmarked category which grants differently-abled people with benefits such as reservation in jobs and insurance coverage among other benefits. In the new draft released by the Union Ministry of Social Justice and Empowerment in September this year, the chapter 6 of the section 39 of the Act, which deals with reservation for employment for persons with benchmark disabilities, takes into account only 16 other kinds of disabilities of the total 18 deformities excluding both haemophilia and thalassemia, life-threatening bleeding disorder, said representatives of the Haemophilia Federation of India (HFI) which submitted a memorandum to the President in this regard. In India, one person of every 5,000 persons is suffering from any of the three bleeding disorders, sickle cell anemia apart from the other two mentioned. As far as haemopilia is concerned, whose maintenance and management warrants an expenditure of Rs 5,000 to Rs. 20,000 on an average, there could be an estimated 1.2 lakh people suffering from it. People with haemoplilia and similar blood disorders live in uncertainty and are prone to frequent bleeding episodes, usually internal, owing to absence of blood clotting proteins called factors that may result from an injury or due to prolonged writing or sitting or even while sleeping. “The risk of bleeding lessens their chances of retention in jobs. As during such instances they may require long leaves and mostly in the private sector, companies are reluctant. It is also seen that their disclosure about their status brings down their chances of selection in interviews,” said Mukesh Ganesh, himself a haemophliac and member of the HFI from Assam. “We are returning after decades to the place where the AITUC was born in 1920...when Lala Lajpat Rai presided over the session. Despite de-industrialisation, Mumbai continues to be a stronghold of trade unionism. Unity among various unions will be demonstrated as representatives of all 11 central trade unions, including those controlled by the Congress and the Bhartiya Janata Party, will be present at the November 27-30 event,” AITUC general secretary Gurudas Dasgupta told The Tribune here. Criticising the Manmohan Singh government, he said that the real economic situation is far more alarming than what was being shared with the country. He blamed the economic policies for the fall in factory output and Index of Industrial Production, high figures of unemployment and inflation. “Recession plus inflation, coupled with high prices, have hit the people. The loss of jobs is leading to violation of labour laws in the country. Instead of checking this trend, the government has raised diesel prices and are planning to hike railway passenger and freight charges,” the CPI leader said. He added that in these circumstances, the government was pressurising the Reserve Bank of India to slash interest rates so that loans could be given to the corporate sector at cheaper rates. Dasgupta said that in a major policy turn, the AITUC would debate the importance of private capital in the economy but feels that it cannot be the principal role. “That role will have to be played by the state to stimulate growth,” he said. He charged that the PM has time to talk to tax evaders but not to listen to the voice of the trade unions. In order to make their voice heard, all the 11 trade unions are working towards yet another all-India general strike, this time for two days, February 20-21. The mishap occurred at Puppalguda at around 8.45 pm when the blaze, which started from a makeshift shed erected by a local shooting unit, engulfed a nearby residential apartment, Cyberabad Police Commissioner Dwarka Tirumala Rao said.He, however, said it was not yet clear whether the victims were residents of the building or comprise any members of the crew.